Support. Longitudinal rumble strips consist of a series of rough-textured or slightly raised or depressed road surfaces intended to alert inattentive drivers through vibration and sound that their vehicle has left the travel lane. Shoulder rumble strips are typically installed along the shoulder near the travel lane. On divided highways, rumble strips are sometimes installed on the median side (left-hand side) shoulder as well as on the outside (right-hand side) shoulder. On two-way roadways, rumble strips are sometimes installed along the centerline. This article contains no provisions regarding the design and placement of longitudinal rumble strips. The provisions in this article address the use of markings in combination with a longitudinal rumble strip. Standard. The color of an edgeline or centerline associated with a longitudinal rumble strip shall be in accordance with EPG 620.1.5 Colors. An edgeline shall not be used in addition to the rumble strip marking that is located along a shoulder. Support. Fig. 620.9.1 illustrates markings used with or near longitudinal rumble strips. Fig. 620.9.1, Examples of Longitudinal Rumble Strip Markings (MUTCD 3J-1) Edgeline located on the rumble strip (Option B). Centerline markings located on a centerline rumble stripe (Option C). Refer to Std. Plan 620.00 for details. Support. Transverse rumble strips consist of intermittent narrow, transverse areas of rough-textured or slightly raised or depressed road surface that extend across the travel lanes to alert drivers to unusual vehicular traffic conditions. Through noise and vibration, they attract the attention of road users to features such as unexpected changes in alignment and conditions requiring a reduction in speed or a stop. This article contains no provisions regarding the design and placement of transverse rumble strips that approximate the color of the pavement. The provisions in this article address the use of markings in combination with a transverse rumble strip. Standard. Except as otherwise provided in the MUTCD 's Section 6F.87 for TTC zones, if the color of a transverse rumble strip used within a travel lane is not the color of the pavement, the color of the transverse rumble strip shall be either black or white. Guidance. White transverse rumble strips used in a travel lane should not be placed in locations where they could be confused with other transverse markings such as stop lines or crosswalks. Support. Rumble strip markings provide notice to the driver that they are leaving their lane. They also provide increased visibility of the pavement markings during wet pavement conditions. Rumble strip markings are a system-wide safety improvement. 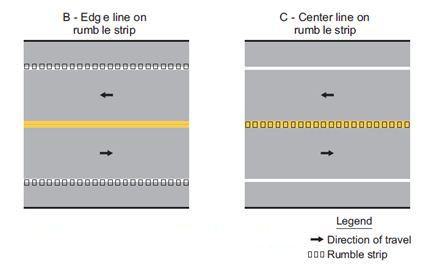 Additional information on the use and application of rumble strip markings can be found in EPG 626. This page was last modified on 18 January 2012, at 14:51.